Reach an unprecedented level of performance optimization data to determine if you're getting speed and power you need from your Salesforce integration. Ensure that your users take advantage of the Salesforce elements you deem critical, and that the use of these elements is both efficient and effective. Audit your Salesforce integration in real-time, and learn how to harden your systems and to quickly identify and rectify possible security breaches. Salesforce is the world's leading customer relationship management (CRM) software solution. As cloud-based software, it allows you to access your customer data from any Internet browser, avoiding the costs of buying, implementing and managing complicated in-house software. It could be argued that satisfied customers are the most important asset of your company. With Salesforce, you can quickly set up a web-based interface for relationship, case and task management, with the ability to escalate significant events. Run lightning-fast log analysis searches that utilize technology and quickly find the answers to critical questions about your Salesforce environment. 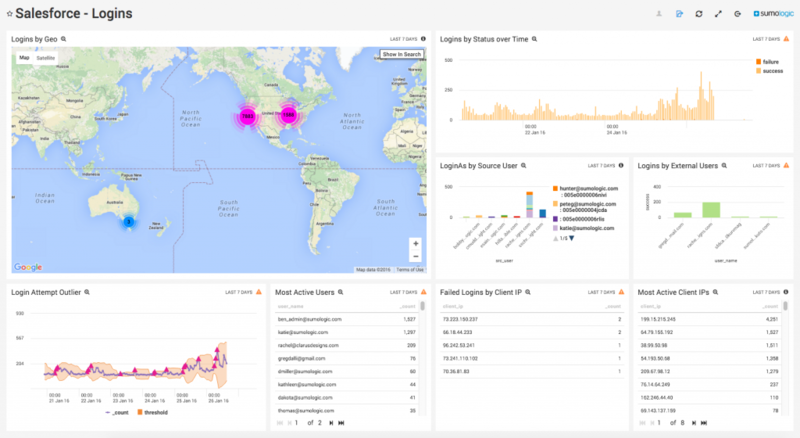 Monitor resource access and collaboration details with analytics in real-time. 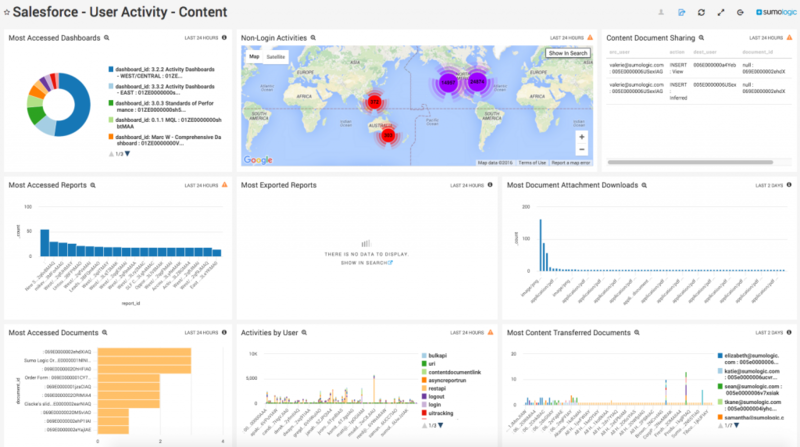 Analyze comprehensive audit trails of user activity. Know which API calls are being made into Salesforce to gain better insight into your resource allocation. Understand report usage and performance to reduce downtime and improve your customer service with fast, insightful readouts that speed error correction. Gain unique insights into your users’ activities and the application’s performance by integrating the Sumo Logic app, which uses real-time machine data to provide a comprehensive analysis of your Salesforce integration. Discover where users are coming from and which ones are the most active. Investigate internal and external users and failed login attempts and set accurate security levels for specific roles to minimize attack vectors from bad actors. Compare data, user and security changes made by administrators, looking for patterns to identify errors or learn new ways employees are using the program. Search for specific events or activity across your Salesforce environment to get immediate alerts about activity outside your preset usage and security parameters. Find out more about how the Sumo Logic log analysis app for Salesforce can help make your organization more efficient, effective and profitable. Check out our demo video to see how Sumo Logic raises log management and analytics to the next level.